There’s a lot of anxiety about. The torch which once lit our path is being extinguished. Our institutions and communities are beset with moral problems, dilemmas and quandaries. Our politics is in crisis, and the world plagued by terrors. At times such as these, people often reach out beyond overpowering events in the hope of being surprised by a promised future of permanence and stability; of confidence, belief and intelligibility. And many look to their Christian leaders to articulate that hope, for these are God’s chosen ones, tasked with pastoring their flocks through moral quagmires and expounding the mysteries of revelation. And they speak the Word of God prophetically into the lives of believers while probing and challenging the lives of non-believers. They speak of sin and redemption, disobedience and egotism, for this is the inescapable human condition. And then they point to the bread of life and tell of the vine and the branches, in the sure and certain hope of an invitation to the messianic banquet for those whose identity is in Christ. Unless you’re the Bishop of Leeds addressing the House of Lords: then your topic is Brexit culture and British hopelessness, mingled with anti-Boris, anti-Rees-Mogg and anti-Trumpist smears and sneers of damnation. Surely, the first requirement of any negotiation is that the negotiators understand the mindset, culture, language and perceptions of the opposite number – get inside their head, look through their eyes and listen through their ears. If I don’t understand what I, we and the world look like through the eyes of my interlocutor, I can’t begin to negotiate intelligently. This goes well beyond figures, facts and tactics; it goes deeper from the superficial to the emotional and subliminal. It is where we discover what actually moves and shapes the mindset, reactions and behaviours of those with whom we seek to trade. Yet, here we are, unable or unwilling to speak the language of those with whom we think we can reach agreement. We just tell them they have to see everything as we do. Just replace ‘negotiators’ with ‘missionaries’ and you have here an essential methodology of mission. Inculturation is the key to communicating the gospel effectually: living with and among the lost – seeing their joys, tasting their griefs and feeling their fears – is the essence of our incarnational vocation. You don’t get anywhere at all in Christian mission by being superior, aloof and patronising. But then Bishop Nick becomes superior, aloof and patronising, talking about political hypocrisy and British hopelessness, which is odd when you consider his task is to persuade those he derides for their hypocrisy and hopelessness, or at least to win the hearts and minds of those who incline toward such a worldview. If Brexit-types are animated by a Trumpist view of the world or have a certain affinity with (or admiration for) Boris Johnson and Jacob Rees-Mogg (and they don’t all, by any means), what is to be gained by coarsening the debate with swipes at their characters or integrity? And why single out Tory Brexiteers for their hypocrisies: do Frank Field and Kate Hoey not quite fulfil the fashionable ‘I’m alright Jack’ Brexiteer caricature? And what about the hypocrisies of Anglican bishops? This really isn’t a great time for a bishop to be lecturing the Government about its deficiencies (which, in any case, ought to be a criticism of the Civil Service, for it is they who undertake such prosaic tasks as translating the Brexit White Paper into German – but why miss an opportunity to denounce the hopeless Tories?). It’s easy to point fingers and sneer at hypocrites, but isn’t the task of a bishop to exhort or foster national unity and the individual’s identity in Christ, rather than foment division and preach about culture? Yes, of course a bishop (as any Christian) may do talk about culture, for inculturation demands an understanding of the culture in which we find ourselves: there is nothing more fruitless than preaching a Hebrew gospel to Greek minds in the hope that the Hellenised heart might supernaturally discern the jots and tittles of messianic eschatology. But why would a bishop use a speech in the House of Lords to deride and condemn rather than envision and inspire? Donald Trump is President of the United States of America, and the British people voted to leave the European Union. The Civil Service makes errors, Jacob Rees-Mogg is a very wealthy man, and Boris Johnson is shameless, if not unscrupulous. What exactly is gained by stringing all these facts together and asserting anti-Brexit notions of British hopelessness, when what is required is a redemptive moment to give the present some meaning so that people may discern a higher reality? Why not talk, for example, about how the Church of England will help to forge “a wide and liberal future“, as the Archbishop of Canterbury exhorts, instead of dwelling in the empty space of wilful blindness, ignorance and incompetence? What is required in the present time is constructive political theology, not partisan socio-political posturing. 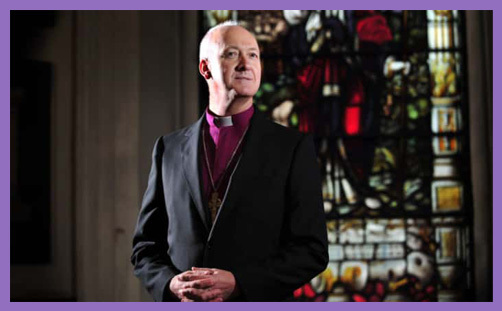 The Bishop of Leeds wants to Remain the European Union, as do all Anglican Bishops (now that +Shrewsbury has stepped down), and Brexit manifestly raises deep and searching questions about British national identity and how our new international relations should be ordered. We get that. But talk of British hopelessness does not offer solutions; nor does it fill the world with love. And berating politicians for their hypocrisy while your own house is mired in allegations of sanctimony, deception and cover-up is not an indication of personal wisdom or political connectedness. God has a plan for the world, and that embraces Brexit just as it has done every other geo-political upheaval throughout history. This is not to claim a divine stamp of approval upon its social consequences and political implications, but to encourage those who perceive nothing but national apocalypse and British hopelessness to transcend the temporal gloom and look to a positive vision of the future, which is indeed wide and liberal, for it is global and catholic; it is open, free and ecumenical. Brexiteers (and quite probably Trump supporters) are rather tired of being ‘othered’ by patronising clergy who seem to think there is no fellowship to be had or reconciliation to be found with them or their views, as though nothing good could ever come of Brexit (or Trump). Wouldn’t it be better for pro-EU/Remain Bishops to try to understand the mindset, culture, language and perceptions of Brexiteers – get inside their heads, look through their eyes and listen through their ears; to move from the superficial to the emotional and subliminal in order to fathom their motives and interpret their beliefs? If the Bishop of Leeds doesn’t understand what he and the world look like through the eyes of Tory Brexiteers, how can he begin to minister to them spiritually?